A lot of you have asked questions about how to create your own Mario-themed room, and I came across these instructions that Nathan Roberts was kind enough to post. This ones specifically geared toward wall paintings and would be suitable for older children too! WOW. I love the way this looks. 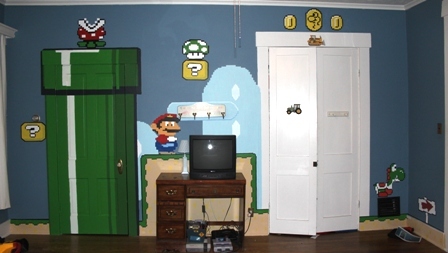 Have you seen the retro game wall stickers by Blik? Great for gamers in apartments who can't paint!